Walsine Pierce: MY BUCKET LIST: A Different, Upcoming Friday Travel Blog! MY BUCKET LIST: A Different, Upcoming Friday Travel Blog! thanks to my son, Mark. Thanks, Bud! I'm the good looking one on the right, un huh! He is my blog site mentor, and a good one, too! I plan to write a different kind of travel blog for the next week or so. Check back Friday for the first installment. TODAY, i'LL SHARE MY "BUCKET LIST" WITH YOU. On 12-25-07 a movie entitled THE BUCKET LIST was released in the U.S. and Canada and, later, in the U.K. and Australia. The movie's $45 million budget was exceeded with a $173.3 million box office return, a real financial success. It seems that everyone had a "Bucket List" and enjoyed watching others actually realize their dreams, wishing they could do likewise. So can you and so can I. And, I will, the good Lord willing and the krick don't get too high! 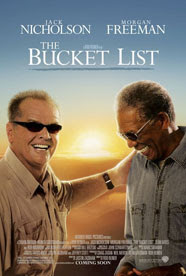 Jack Nicholson and Morgan Freeman starred as two terminally ill cancer patients who decide to break out of the hospital and live their last days to the full, fulfilling a list of wishes before they "Kick the Bucket". They sky dived, climbed the pyramids, drove a Shelby Mustang, flew over the North Pole, ate dinner at Chevre d'Or in France, rode motorcycles on the Great Wall of China and go on a Lion Safari. They had quite a bucket list between them. I HAVE A BUCKET LIST! I'll share with you the major travel plans in my bucket list. These are the major trips I have in my "bucket". using ground transportation to see other nearby countries. living on a shanty boat which I'll build this winter and spring. ISN'T THIS A DELIGHTFUL, MODERN-DAY SHANTY BOAT? There are dreams and there are plans. THERE IS A VAST DIFFERENCE! Spring 2012 - Bike rides across the country. Fall 2012 - live in the south on a shanty boat. Late spring 2013 - Drive to Alaska. Fall 2013 Fly around the world. Making my "Bucket List" a reality will be a challenge physically, materially and financially. I thrive on challenges, however, considering problems to simply be unrealized opportunities. A dear sister-in-law once asked how I knew what I was going to do 10 months from the moment when she didn't know what she was going to do 10 minutes from then. Actually, I don't "know". I do know that if you plan something it may not happen but if you don't plan it it certainly won't happen. These are my plans which I'll develop and share with you. SO, WHA'CHA GOT IN YOUR BUCKET? *Tour Frank Lloyd Wright's architectural masterpiece "Fallingwater"
Those were both wonderful experiences. My dream of traveling to Paris to tour the Louve and visit Monet's Garden in Giverny.